Offer orioles all their favorites — in eye-catching orange! 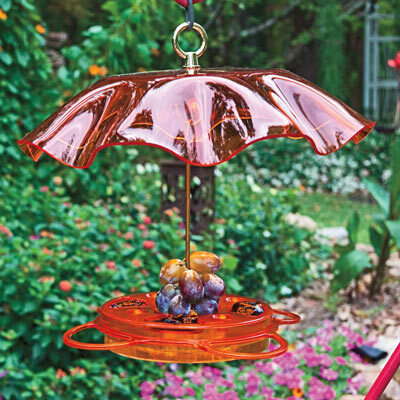 The bright, shiny orange weather guard will not only catch the eye of any Oriole in the area, but also offer protection from the weather for food and visiting birds! The equally colorful food dish accommodates all the favorite foods of Orioles: the basin holds 12 oz. of nectar and has 4 feeding ports for the birds to drink from; there are 4 jelly trays (Orioles LOVE grape jelly! ); and an orange half or other fruit can be impaled on the center hanger. The large perches are scaled to meet the needs of an Oriole, and there is even an ant moat in the center of the basin to discourage those industrious creatures! The top is made of premium 1/8" acrylic, the basin of tough, translucent plastic, and the hook and hanger are of sturdy metal. Assembles in a snap and comes with simple directions. The basin is 10-1/2" across, with the hanger it is 8-3/4" tall, and the guard on top is 13" across. A great all-in-one Oriole feeder that will last for years!